It's back to school season and BLINQ.com is here to give you the best deals and prices on laptops, backpacks, clothes, tablets and more! BLINQ works with major retail partners to sell their excess, open box and refurbished inventory of top brands. They offer a huge selection of products like laptops, tools, kitchen appliances, toys, smartphones and more, all up to 70% off retail price! You will find brands like Apple, Samsung, Dell, Kenneth Cole, Calvin Klein, Disney and more-- the list goes on and on! Right now BLINQ has great prices on a lot of back-to-school items! Check out what we found and thought you would love! BLINQ Promise: Every product is professionally inspected and tested. If your order doesn't meet expectations or you change your mind, you can send it back for a full refund. (BLINQ even has a best price guarantee!) And they offer free shipping on everything! BLINQ has got you covered and is ready to help your back-to-school shopping a breeze! Head on over to check out all their great prices on products you'll love! Be sure to stay connected with BLINQ on Facebook, Twitter, Instagram and Pinterest! 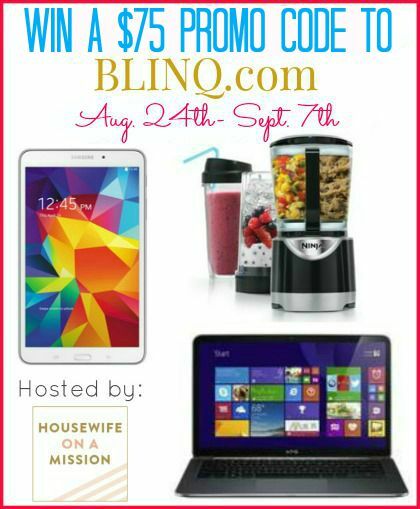 One of our readers are going to win a $75 promo code to BLINQ.com! Disclosure: Housewife on a Mission and the participating bloggers are not responsible for prize fulfillment or shipment to giveaway winner. Winner will be drawn at random then emailed and will have 48 hours to respond to claim their prize. If no response is given, another winner will be chosen. The promo code will be for $75 off a purchase and can be used on products priced at $76 or more. The code cannot be redeemed for a product less than $76. If the winner wants to purchase a lesser priced product, BLINQ can update the promo code so that the purchase minimum is a dollar higher than the product the winner wants to purchase. Facebook, Twitter, Pinterest, and any other social media are not affiliated with this giveaway.